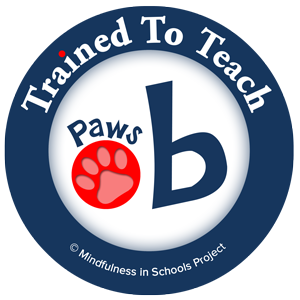 Paws b is a classroom-based mindfulness curriculum for 7-11 year olds. It is made up of 6 themes that can be delivered over 6 weeks (one hour sessions) or 12 weeks (30 minute sessions). The curriculum was co-developed by teachers with students from Ysgol Pen Y Bryn in North Wales alongside a senior mindfulness teacher and trainer with the Centre for Mindfulness Research and Practice at Bangor University in Wales (one of the most renowned institutions for mindfulness research and practice).